Vusi Sibanda's cheeky cut over the slips. Morne Morkel beating Donald Tiripano's inside-edge with a seaming delivery that was too good for the nightwatchman. The ball from Dane Piedt that turned from offstump to a foot outside leg stump. Richmond Mutumbami's cover drive laced with class. Moments connected by periods of what you would see if you lay down on the grass embankments at Harare Sports Club and looked up at the sky: wisps of white floating lazily, dreamily, even aimlessly. That is the kind of Test match this was. The odd moment of brilliance cut through otherwise predictable proceedings. The expected result eventually came but it took longer than was thought necessary and the resistance was more robust than it was supposed to be. On a surface which the South Africans said made them feel as though they were back in Sri Lanka, the passages of play they did not dictate took place in slow-motion. Their own run-scoring was laboured, punctuated with leaving and blocking, and lacked intent. Where they could control, which was mainly with the ball, they made use of the turn and reverse-swing on offer and in an important period after lunch on the final day, a series of five moments undid Zimbabwe's 10 sessions of fight. That was really all South Africa needed. They were not looking for a perversely big or quick win, just a win, "even if we win on the last session of the last day", as JP Duminy put it. That it happened in the dying period of day four served as testament to Zimbabwe's pluckiness. On their own pitch, designed mostly to protect against the real danger South Africa's pacers could pose, Zimbabwe persisted for longer than teams ranked places above them who play more regularly than they do. They have only had one opportunity to tussle in a Test in this year so tussle they did, as tough as it was. The good news for Zimbabwe is that, like South Africa, they have three Tests scheduled before next year's World Cup - but not too many after that either - so this match was an important information-gathering exercise for both teams. Zimbabwe needed to see that they still had both the desire to play Test cricket and the personnel; South Africa the same, although on a different scale. Despite being the No. 1 ranked team in the world, South Africa will only play six Tests in 12 months from this July to next. To hold on their ranking during that drought, they need to get things exactly right most of the time and will need to, again, in the home summer when they host West Indies. Again, it is anticipated they will dominate the opposition and they have made some discoveries over the last month which could help them do that. Hashim Amla's ease at accepting the captaincy was one of them because he did not once appear overwhelmed by his task. Piedt is one for the future and has shown the direction to take after Imran Tahir. Quinton de Kock's promotion to the side is another positive. Not only has he relieved AB de Villiers from behind the stumps but he also proved an able No. 6 batsman to add to South Africa's strength in that department. 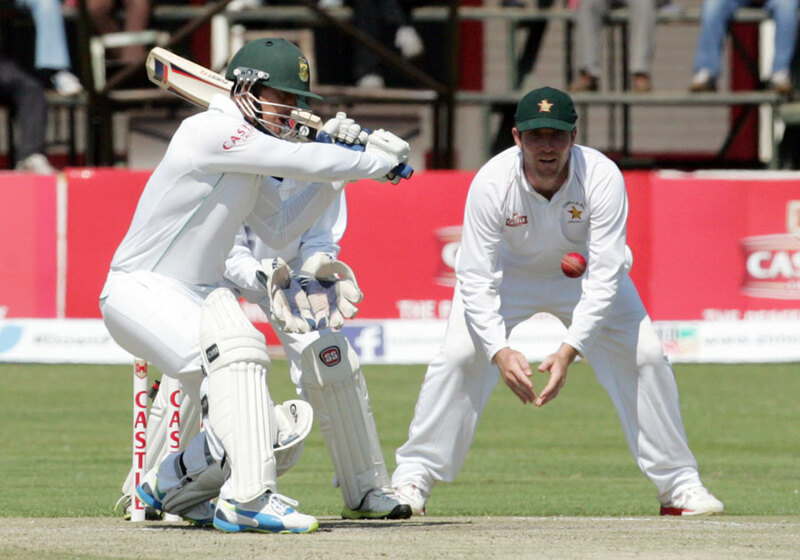 De Kock was the batsman who showed the greatest sense of purpose in Harare. That he has the ability to score quickly and what appears to be fairly effortlessly does not hurt. He will be one of the players most closely watched in the coming season when local fans are less likely to be as tolerant of the go-slow batting approach they have witnessed from the distance of their television screens over the last two matches. Pitches in South Africa will certainly facilitate quicker run-scoring but the team will perhaps have to relook at at least one of the people tasked with doing that. Before the Harare Test they already identified Alviro Petersen's spot as one that may become a vacancy and his showing in the Test would have confirmed that. With yet another unconverted start, Petersen has taken his run of the innings without a century to 23. Since the Pakistan series in February last year, he has scored 493 runs, including two fifties, in 22 innings and averaged 24.65. That is lower than his Zimbabwean counterpart Vusi Sibanda, who has also had calls for his head. Since Zimbabwe's Test comeback, Sibanda has notched up 523 runs in 20 innings at an average of 26.15 with two fifties. In this match, Sibanda acquitted himself well enough to buy himself some time with his second innings showing but he will be expected to deliver more than he has done in the recent past when Zimbabwe tour Bangladesh later this year. They are due to play their first three-Tests series in more than 13 years this October and the duration of the contest will be as much a challenge as the conditions. Brendan Taylor expects the subcontinent to somewhat resemble what Zimbabwe had in Harare and has identified finding "two good spinners" as crucial to success on that tour. Already, they may have one. Offspinner John Nyumbu became only the second Zimbabwean to claim a five-for on debut and although he had conditions in his favour and may still lack some control, he could be an option to partner either Prosper Utseya or Natsai Mushangwe. What Zimbabwe will not want for when they take on Bangladesh is determination. They showed their enthusiasm to embrace the uncomfortable when they took on the best team in the world with brave faces and big hearts. South Africa won the match, Zimbabwe won admirers. Even if only for a few moments.